Also known as Cohiba Red Dot, these hand-rolled premium cigars are exclusively created by expert cigar rollers in the Dominican Republic. Cohiba Dominican cigars are medium-bodied, constructed with a seamless African Cameroon wrapper and featuring three varieties of Cuban seed tobaccos masterfully blended to produce a smooth, flavorful smoke. 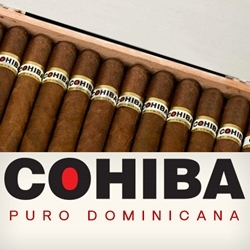 Cohiba Dominican premium cigars have been rated 90+ numerous times. True cigar connoisseurs have long established the Cohiba brand as one of the world’s finest premium cigars, we at Smokers Discounts believe you will too! If you looking for a great smoke at a great price, Cohiba Dominicans are handmade premium cigars that deliver time and time again. Every cigar purchased on our online cigar store can be delivered right to your front doorstep. We’ve made it easy and affordable to buy hand-rolled cigars. A variety of sizes and flavors are listed below, each of these styles are in stock and available for a low discount price! Call us for more details!